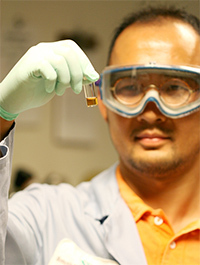 UCSD graduate student Ji-Ho Park was one of the researchers who headed the effort. “This study represents the first example of the benefits of employing a cooperative nanosystem to fight cancer,” said Michael Sailor, a professor of chemistry and biochemistry at the University of California, San Diego and the primary author of a paper describing the results, which is being published in a forthcoming issue of the Proceedings of the National Academy of Sciences. An early online version of the paper appeared last week. In their study, the UC San Diego chemists, bioengineers at MIT and cell biologists at UC Santa Barbara developed a system containing two different nanomaterials the size of only a few nanometers, or a thousand times smaller than the diameter of a human hair, that can be injected into the bloodstream. One nanomaterial was designed to find and adhere to tumors in mice, while the second nanomaterial was fabricated to kill those tumors. These scientists and others had previously designed nanometer-sized devices to attach to diseased cells or deliver drugs specifically to the diseased cells while ignoring healthy cells. But the functions of those devices, the researchers discovered, often conflicted with one another. 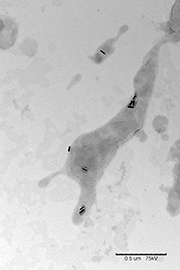 Gold nanorods accumulate in tumors. When a single drug does not work in a patient, a doctor will commonly administer a cocktail containing several drug molecules. That strategy can be very effective in the treatment of cancer, where the rationale is to attack the disease on as many fronts as possible. Drugs may sometimes work together on a single aspect of the disease, or they may attack separate functions. In either case, drug combinations can provide a greater effect than either drug alone. Treating tumors with nanoparticles has been challenging because immune cells called mononuclear phagocytes identify them and yank them from circulation, preventing the nanomaterials from reaching their target. Ji-Ho Park, a graduate student in Sailor’s UC San Diego laboratory, and Geoffrey von Maltzahn, a graduate student in Bhatia’s MIT laboratory, headed the effort to develop two distinct nanomaterials that would work in concert to overcome that obstacle and others. 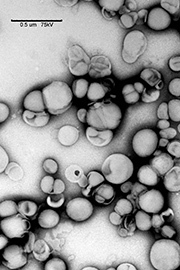 The first particle is a gold nanorod “activator’ that accumulates in tumors by seeping through its leaky blood vessels. The gold particles cover the whole tumor and behave like an antenna by absorbing otherwise benign infrared laser irradiation, which then heats up the tumor. Doxorubicin-loaded liposomes are designed to kill tumors. After the nanorods had circulated in the bloodstream of mice that had epithelial tumors for three days, the researchers used a weak laser beam to heat the rods that attached to the tumors. This sensitized the tumors, and the researchers then sent in a second nanoparticle type, composed of either iron oxide nanoworms or doxorubicin-loaded liposomes. This “responder” nanoparticle was coated with a special targeting molecule specific for the heat-treated tumor. Much of that work was done in the laboratory of Erkki Ruoslahti, a cell biologist and professor at the Burnham Institute for Medical Research at UC Santa Barbara, and another co-author of the study. While one type of nanoparticle improves detection of the tumor, he said, the other is designed to kill the tumor. The researchers designed one type of responder particle with strings of iron oxide, which they called “nanoworms,” that show up brightly in a medical magnetic resonance imaging, or MRI, system. The second type is a hollow nanoparticle loaded with the anti-cancer drug doxorubicin. With the drug-loaded responder, the scientists demonstrated in their experiments that a tumor growing in a mouse can be arrested and then shrunk. “The nanoworms would be useful to help the medical team identify the size and shape of a tumor in a patient before surgery, while the hollow nanoparticles might be used to kill the tumor without the need for surgery,” said Sailor. “This study is important because it is the first example of a combined, two-part nanosystem that can produce sustained reduction in tumor volume in live animals,” said Sailor. The project was funded by grants from the National Cancer Institute of the National Institutes of Health. Bhatia is a Howard Hughes Medical Institute Investigator.